How To Start A Craft Business - Informations & Resources! Starting a Home Craft Business ! If you're creative and enjoy working with your hands, a crafts business could be your path to financial independence. With a minimal investment you can start grossing up to $100,000 a year doing something you love. In fact, according to the Craft Organization Directors Association, there are 106,000 to 126,000 craftspeople working in the United States today and the average gross sales/revenue per craftsperson is $76,025. There is a lot of money to be made. Starting a craft business can be much more profitable as a full or even part time business than you might think. Sure, a lot of people sell crafts part-time for a little fun and extra income. Waho-Biz.com is pleased to provide this crafting resource site for starting a craft business. Whether you are just starting out or have lots of experience in craft business, you are sure to find some useful information here to help create, enhance, promote and advertise your crafts business. Here's everything you need to know organized in step-by-step directions to start and grow your craft business. Our guides will tell you how to get started, which crafts have paid off for others, how to market your product, and the best places to sell your crafts. 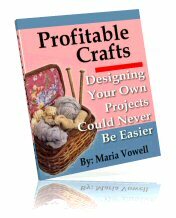 Profitable Crafts Series by Maria Vowell. She has mentored literally hundreds of crafters, both online and off, and helped them turn their part time hobby into a profitable full time business. Maria has over 15 years experience of providing her mentoring services for craft related topics. Maximizing Your Profits from Craft Sales: Find out how to create product quickly; price your products easily and with maximum profitability and more. Consignment Sales and Getting Your Products Published: Easily convince store owners to sell your products; find out how to write up agreement with store owners; getting your designs published in magazines and other publications. Designing Your Own Projects Could Never Be Easier: Designing terrific products with low-cost or even household items; tons of creative ideas on producing your crafts quickly. Catalog Sales & Recruiting Others to Sell for You: The way you'll make the most money in this business is by having others sell for you. Find out how easy it is to find your very own sales force. 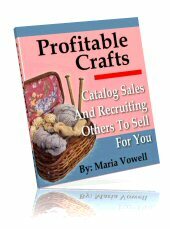 Everything you need to succeed at your craft business is in these books, ready to take you by the hand and show you where the money is in pricing and selling your crafts. Start your own craft business, work from home, shape your own destiny. And besides keeping the price affordable, I'm going to throw in - absolutely FREE-of-charge, SIX outstanding bonuses you simply must have. If you love to crochet, then you're going to love the patterns provided here. There are 20 vintage crochet patterns provided in this manual. The patterns provided are not only easy to crochet, they are also top selling items at craft shows, fairs and bazaars. You'll find your hook flying so fast as you stitch some of these projects. You'll quickly build your stock in no time!! 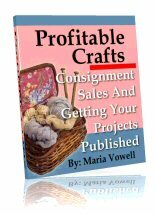 Sell the products to other places or people as well for Maximum Unlimited Profits with our Free Craft Fair eBook! - Where to find supplies and equipment in a directory of over 400 craft supply and equipment dealers. - A list of 4000 online auctions to sell anything from crafts to electronics. - The 3 most effective ways to make substantial amounts of money in crafts. - 6,000 craft shows in the U.S. organized by state. - A list of flea-markets, swap meets, farmers markets and trade shows held in the U.S.
- Database of art and craft shows that reach 100,000+ visitors every year. - Database of 7,000+ nationwide craft shows and festivals with contact information! How To Make Lamps & Vases From Bottles. The scents and beauty business course is written to help people start an affordable home based business, selling homemade bath and aromatherapy related products. A Total Value of $197.99! You have read what others say. It's clear, you have nothing to lose and much to gain. You will soon be creating a successful craft business following the information provided on our guides, guaranteed. Don't waste another dime. Don't spend another week procrastinating. Don't waste another minute wondering what to do with your crafts. Take the first sure step to work from home profits right now. $97.95 $39.97 for a very limited time! This is an introductory price and it won't last long. I'm only guaranteeing the availability of this price for a short time, so it's best if you order yours today. It's completely risk free! Todays Special Price ONLY $39.97! This low price will be ending on at Midnight. P.S. Order today to ensure that you gain access to SIX outstanding bonuses you simply must have! absolutely FREE-of-charge. These super BONUSES could be canceled at any time, and you most certainly want to purchase "Craft Business Pack" while you still have the chance!